I taste a lot of American craft beer – what I don’t get as much of in my beer travels (and by “travels,” I mean various beer bars, mostly close to my house) is craft beer from abroad. I came across Borg Myrkvi No. 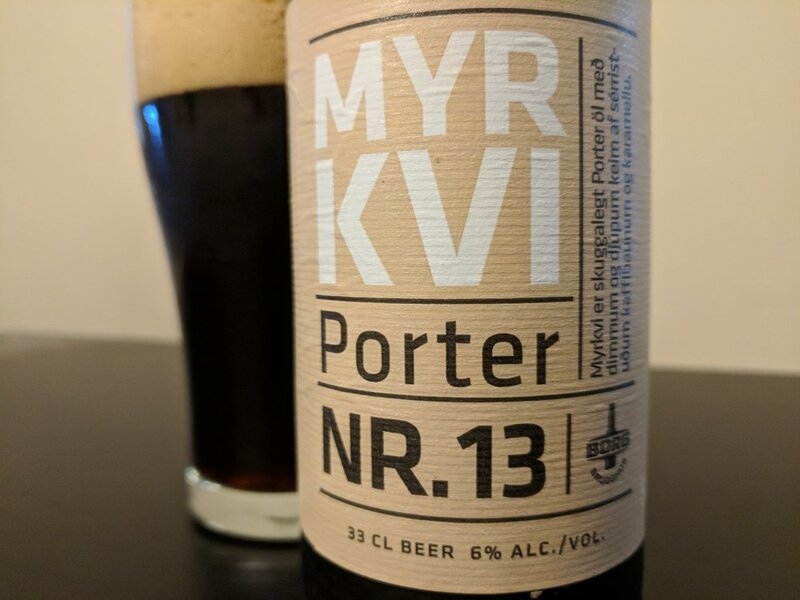 13 Porter, a beer brewed in Iceland, in a bottle shop in central Wisconsin (not close to my house) and took a chance. The beer wasn’t a game-changer, but the blind try offered a nice enough payoff. When I checked out the website for Borg Brugghús, the Reykjavík-based craft brewery responsible for Borg Myrkvi No. 13, I expected to find more traditional European beers in the brewery’s lineup, but it offers up a variety of products that will look familiar to fans of American craft beer: a session IPA, a mango pale ale, a hoppy blonde and an amber to go with plenty of other varieties. And yes, Borg Brugghús does German-style beers and Belgians, not to mention a few sours, plus many imperial styles, so the variety is impressive. The brewery’s mission, if you will, is to “incorporate Icelandic cultural traits and local ingredients to its wide variety of beers and pair with food.” Apparently, it works, as the brewery has won awards in several prominent beer competitions. This unfiltered porter pours with an ample, creamy, tan head and offers up a chocolaty aroma with notes of roast. The body is jet black with almost no translucence, even when held up to light (Myrkvi means "darkness" in Icelandic, so …). Not surprisingly, the beer’s label offers up a “dark twist,” which is the presence of Colombian coffee. The coffee isn’t necessarily pronounced in the aroma or flavor, but there is a noticeable depth it adds to the mix. There also are multiple roasted malts in the mash bill, not to mention oats, giving the beer a thick body with a rich flavor profile and a finish that dries out to a moderate, pleasing bitterness. For a beer that’s only 6 percent alcohol, there’s plenty of body with subtle flavors of cocoa, roast and coffee that mingle well. Nothing about the beer “pops,” necessarily, but it’s a satisfying experience to put away 12 ounces of Borg Myrkvi. Again, this beer isn’t a game-changer for the palate, but it’s certainly a solid representation for the brewery. In other words, I’d be more than welcoming to try another one of Borg Brugghús’ beers. Now, if I can only make it to Iceland. I taste a lot of American craft beer—what I don’t get as much of in my beer travels (and by “travels,” I mean various beer bars, mostly close to my house) is craft beer from abroad. I came across Borg Myrkvi No. 13 Porter, a beer brewed in Iceland, in a bottle shop in central Wisconsin (not close to my house) and took a chance. The beer wasn’t a game-changer, but the blind try offered a nice enough payoff. This unfiltered porter pours with an ample, creamy, tan head and offers up a chocolaty aroma with notes of roast. The body is jet black with almost no translucence, even when held up to light (Myrkvi means "darkness" in Icelandic, so …). Not surprisingly, the beer’s label offers up a “dark twist,” which is the presence of Colombian coffee. The coffee isn’t necessarily pronounced in the aroma or flavor, but there is a noticeable depth it adds to the mix. There also are multiple roasted malts in the mash bill, not to mention oats, giving the beer a thick body with a rich flavor profile and a finish that dries out to a moderate, pleasing bitterness. For a beer that’s only 6% ABV, there’s plenty of body with subtle flavors of cocoa, roast and coffee that mingle well. Nothing about the beer “pops,” necessarily, but it’s a satisfying experience to put away 12 ounces of Borg Myrkvi.